Bungie, creators of the hit game Destiny, is going through a bit of a rough stretch. Whereas Witcher 3 creators CD Projekt Red have been showing the gaming industry how to do everything right in regards to DRM, DLC and consumer interaction, Bungie apparently decided to give a master class over the last few weeks on how to do everything very, very wrong. "Eurogamer: Can you see that some fans are confused that you're asking them to buy stuff they already own? Luke Smith: Yeah, I can totally empathise with those people. But the Collector's Edition is a pretty cool package for people who want to pursue that stuff. Otherwise, surely what you're saying is that you would want to buy them separately, right? Eurogamer: Well, yeah. I would rather do that - pay a few pounds or dollars or whatever - than spend money on things I already own. Luke Smith: [Laughs] Well, we have nothing more to talk about regarding your opportunity to spend extra money in Destiny, other than The Taken King and the three versions we've announced"
Talk about non-answers. Smith essentially laughs off concerns about Bungie double dipping, arguing that users just haven't seen the full awesome scope of what Bungie has planned. When pressed by Eurogamer, Smith would only elaborate that the company is "really comfortable with the value" they're offering consumers. That of course completely ignored the fact that most Destiny fans were making it very clear they were not seeing said value whatsoever. Not too surprisingly, based on Smith's seemingly-flippant tone in the article, many Destiny fans felt they were at best being ignored, and at worst being laughed at. 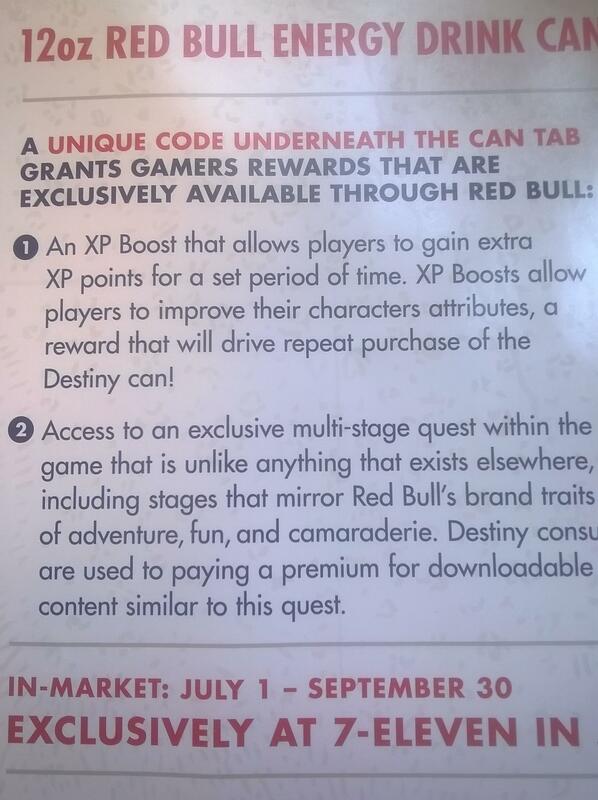 Over at Reddit, someone posted some leaked Red Bull marketing materials for the promotion, which are quick to highlight how this kind of stuff is great because Destiny players are "used to paying a premium for downloadable content." Isn't nickel-and-diming fans, like, totally rad? "Reading my interview with Eurogamer and imagining it came from some random developer of a game I love - that random developer looks like an Asshat. But that Asshat was me - and those words rightfully anger you. I'm sorry. My words made it sound as if Bungie doesn't care about their most loyal fans. We do care. We are listening. And we will make it right." Of course, Bungie wouldn't have to "make it right" if it hadn't tried to aggressively nickel-and-dime its loyal fans in the first place. And Bungie, like many companies, wouldn't be trying to aggressively nickel-and-dime loyal fans if gamers didn't perpetually reward this kind of behavior by lapping up garbage pricing and content whenever it's shoveled in their general direction. At the end of the day, the way to stop this kind of pricing isn't to raise hell after the fact (though obviously that helps), it's to avoid paying companies that exhibit this kind of behavior in the first place. So the company backed off, gamers flock, buy the goddamn dlc instead of showing with their wallets how much they like being laughed at. Right? That's why these companies keep shitting at their their customers. Because they know in the end the money will flow in even if they screw up.